Press potatoes through potato ricer, or mash until smooth. In large bowl, mix potatoes, lime juice, salt, pepper and chiles. In medium bowl, mix chicken, peas, carrots, onion and mayonnaise. Place half of potato mixture on large serving platter; form into rectangle shape about 11x7 inches. Spoon chicken mixture over potato mixture on platter; sprinkle with additional salt and pepper as desired. Top with remaining potato mixture, shaping into rectangle shape. Refrigerate 1 hour before serving. Garnish top of potato mixture with parsley, olives and chopped eggs. Arrange lettuce leaves around potato mixture. Cut into squares. Cooked shredded rotisserie chicken can be used. 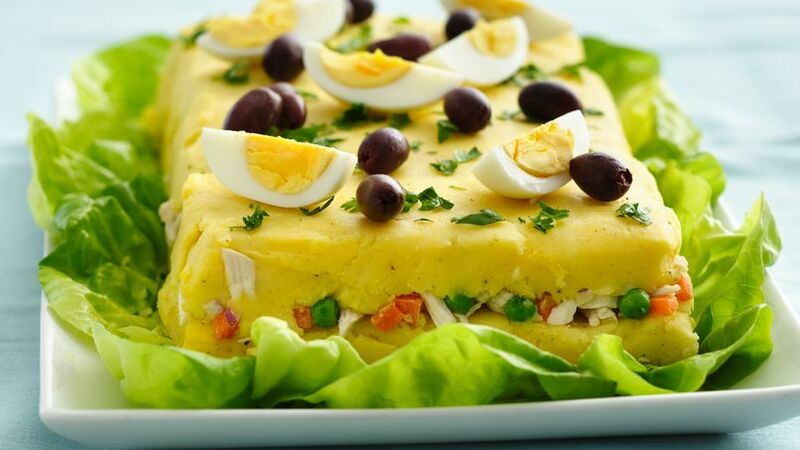 Add Peruvian flavors to your meal with this layered potato and chicken recipe. A wonderful side dish made using sweet peas.